Donald Trump’s “America First” trade policy is backfiring. The US president’s imposition of steel and aluminum tariffs on the European Union and other allies—pitched as a way to boost domestic manufacturing and protect local jobs—were swiftly met with retaliatory tariffs. The EU’s tariffs went into effect on Friday (June 22), following through on a threat to target Harley-Davidson motorcycles, Levi’s jeans, and bourbon. In response to the EU tariffs, Harley-Davidson said today that it plans to absorb the financial hit of more expensive motorcycles in Europe, rather than raise prices to make up for the cost of tariffs. To cushion the blow, the company said it would shift some production outside the US, potentially putting American jobs at risk. Tariffs on Harleys imported in the EU have risen from 6% to 31%, increasing the cost of the average hog by $2,200, the company said in a regulatory filling. The Milwaukee-based company doesn’t want to risk losing sales by passing on this “tremendous cost increase” to dealers and customers in Europe, so instead it will take a financial hit of between $90 million and $100 million on an annual basis. The cost to the company for the rest of this year is expected to run between $30 million and $45 million. The EU targeted imported motorcycles because Harley-Davidson is based in the home state of House Speaker Paul Ryan, so the tariffs could exert pressure on the Congressional leader (who says he is no fan of Trump’s tariffs) in an important swing state. You would also be hard pressed to find a more highly symbolic target of American manufacturing. To try and reduce the long-term cost of the tariffs, Harley-Davidson said it would move production of EU-bound motorcycles from the US to plants it operates elsewhere in the world. The company said that despite being committed to US-based manufacturing, the move is the “only sustainable option” to maintain its business in the EU. Last year, nearly 40,000 new Harley-Davidson bikes were sold in Europe, the company’s second-largest market. 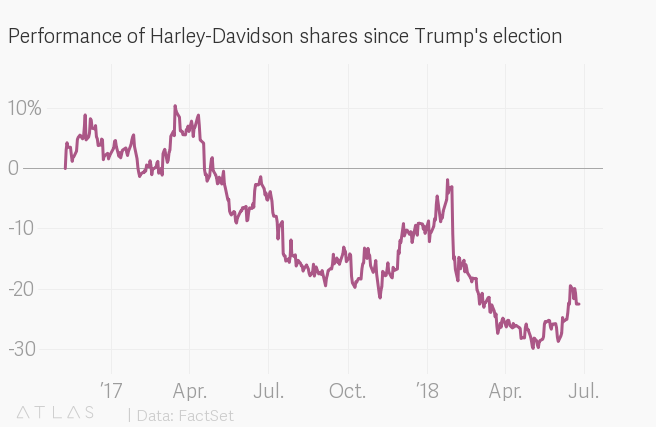 Before the trade war revved up, Harley-Davidson was already struggling due to a huge drop in sales in the US. The company is keen to protect its international sales, despite the noise it may make for political backers of protectionism.